Guitars, Gear, and a Bit of Ukulele Clinic event with Mr. Gilewitz. Learn tricks of the trade, watch some cool demonstrations, enjoy a performance, and consider playing guitar or ukulele for LIfe. It’s fun, inspirational, and informative. 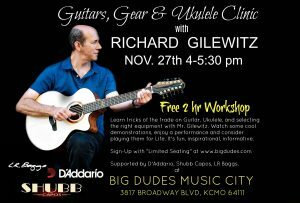 Hosted by Big Dude’s Music City and supported by D’Addario, Shubb Capos, LR Baggs and is open to the public at no charge.